With multiple reports suggesting the Eagles are set to aggressively pursue Bears offensive coordinator Adam Gase, and one report going as far as saying the Eagles have offered him the job, I decided to dig into Gase’s background and the type of offense he will bring to the table. Almost intuitively, the first thing I noticed was the differences between Gase and his predecessor, Chip Kelly. This same thing happened when Kelly was hired. Many celebrated the fact that Kelly was a run first coach who liked big defenders. As Kelly was known to say, “big people beat up little people.” This was a breath of fresh air after 14 years of Andy Reid giving up on the run with reckless abandon and relying on undersized defenders who could “fly to the football” (but not make the tackle, of course). So I have a feeling many Eagles fans will appreciate some of the things that Gase brings to the table that were perceived weaknesses for Kelly: Gase has a pro background (for whatever that is worth), he has shown a willingness to adapt his offense to fit his personnel, he has a great track record with quarterbacks, and he strikes the proper balance between holding players accountable but also maintaining close relationships. But I digress. While Gase lacked the playing experience, he cut his teeth among some of the best coaches in the game. Gase attended Michigan State University while Nick Saban was the coach and was able to work under Saban as a student assistant coach. When Saban left for LSU in 2000, Gase was the only assistant coach that he brought with him, a telling sign about the level of respect Saban had for Gase. “It was a conceptual thing with Adam, he just understood how things worked and he was willing to work and start from ground zero,” Saban said in an email to the New York Times. Along the way, he has worked with coaches that abide by a variety of offensive philosophies: the west coast system under Steve Mariucci, the Don Coryell-based digits system under Mike Martz, and the offense Peyton Manning ran to great success with the Indianapolis Colts. It was that diversity of experience that shapes Gase’s offensive scheme now, which you cannot neatly fit into one package. Looking over film of the offenses that Gase ran in Denver and Chicago, you see concepts from a number of different offensive systems. One minute the Broncos or Bears would call a Peyton Manning staple: the dig concept; the next, it’s a West Coast offense staple with the quick slants; and the next minute, its deep vertical passes from the Mike Martz/Air Coryell school of thought. 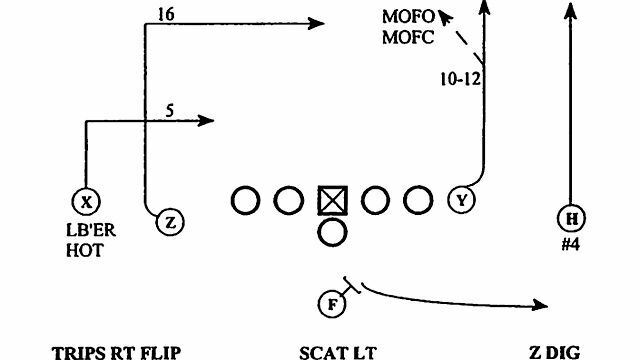 Mixed in, you see some bubble screens, and of course, even a little no huddle, up-tempo offense (but relax, Eagles fans, it is used sporadically, not as an overriding philosophy). The fact that Gase has married so many different passing concepts into one hodgepodge of an offense speaks to one of his greatest strengths: his ability to adapt to his personnel. To say that Gase has worked with a diverse set of quarterbacks would be an understatement. From the run first, throw third approach of Tim Tebow, to the statuesque pocket passer of Peyton Manning, to the middle ground provided by Jay Cutler, Gase has seen it all. At each stop, he modified his offense to maximize what his quarterback did best. With Tebow, it was a run first offense with simple passing concepts and designed quarterback runs to mask Tebow’s obvious flaws. The Broncos lead the NFL in rushing attempts with 546, while ranking dead last in passing attempts with 429. When Mike McCoy became the head coach of the San Diego Chargers in 2013, Gase was promoted to offensive coordinator. He revamped the Broncos offense to incorporate more of the passing concepts that Manning was familiar with and used to great success in Indianapolis. The dig concept was simple: the outside receiver runs a five-yard in-route, while the inside receiver runs a deep in or dig route. On the opposite side of the field, the outside receiver runs a go route, with the inside receiver running a “read-seam” that breaks depending on whether there is a single high or two deep safeties. Manning ran this play up to 10-20 times a game with minor variations (wait — you mean an offense can be predictable but successful as long as players execute?! What a novel concept!). While it was used in 2012 under McCoy, Gase relied on it even more, as well as other concepts that Manning was accustomed to. Needless to say, it worked: the Broncos rode the most prolific offense in NFL history to a Super Bowl appearance. But it’s not just offseason adjustments; Gase has also shown a proclivity for making mid-season and mid-game adjustments. In week 11 of the 2014 season, the Broncos offense hit a standstill. Touchdown machine Julius Thomas suffered an ankle injury that hampered his production and Manning’s arm strength was becoming problematic, especially as the weather got colder. The Broncos had lost two of three, including an embarrassing 22-7 drubbing at the hands of the St. Louis Rams. So Gase abandoned the pass heavy approach in favor of a more dominant rushing attack, often using six offensive lineman and relying on C.J. Anderson’s fresh legs to carry the heavy workload. Manning went from averaging 40.7 pass attempts per game to 31.6, and the offense flourished. The Broncos ended the season winning five out of their last six games en route to a 12-4 record. Gase’s versatility will likely be a selling point to Jeffery Lurie and Howie Roseman. Kelly seemed hellbent on fitting players to his system instead of the other way around. Gase takes the opposite approach, catering his offense to his personnel and the circumstances, and has done so to great success. With Adam Gase as the quarterbacks coach, Tim Tebow led the Broncos to an 8-8 record and a wild card playoff win. The record setting offense of 2013 was Gase’s best statistical accomplishment. And his work in 2014 was a good example of how Gase can adjust on the fly. But perhaps his best work has been his reclamation project of the enigma that is Jay Cutler. Cutler was once considered one of the best young quarterbacks in the NFL. But over the last six seasons, his bad habits are matched only by his bad reputation, with many around the league considering Cutler a lost cause. But Gase worked with Cutler on limiting his turnovers and making smart decisions under pressure. And he tailored the offense and his play calling to effectuate that goal: providing Cutler more time to examine the defense at the line of scrimmage and calling more pass plays that called for Cutler to get the ball out quickly. Under Gase, Cutler has played some of the best football of his career. Consider this: Cutler’s career DYAR and DVOA efficiency ratings, per FootballOutsiders.com: 25.88 and 20.55, respectively. (His DYAR high was 4, with a low of 33; his DVOA high was 4, with a low of 30). But this year? Cutler ranks 10th in DYAR and 13th in DVOA. He hasn’t had numbers that high since his third year in the league (2008), when many saw Cutler as the second coming of Brett Farve. He has a career high in passer rating (92.3) and the second best interception rate (2.3%) of his career. And all of this was accomplished with his top four receivers — including Pro Bowl talent Alshon Jefferey — missing a combined 31 games. In a league starving for quarterbacks, one of Gase’s strongest selling points will be his success with each of the quarterbacks he’s coached. From Tebow, to Manning, to Cutler, each have benefited from Gase’s tutelage. And with the Eagles facing uncertainty at the position, bringing in a coach with experience in getting the most out of whoever their quarterback is — be it Sam Bradford or a high draft pick — will be critical. One of the strongest criticisms leveled at Kelly was his inability to connect with his players but also hold them accountable. It is not an easy task; it requires striking the proper balance between developing close ties with your players while holding them to a high standard. “He’s all about accountability,” Slauson said. “He expects guys to do what they’re supposed to do. He holds guys to a very high standard. But there is a “working relationship,” receiver Marc Mariani said. A dialogue exists with players, particularly with quarterback Jay Cutler, who has a career-best 92.8 passer rating. It’s that ability to connect with players while pushing them to achieve their potential that has resonated most with his players. Anyone that has followed the fallout from Chip Kelly’s firing will understand that the Eagles are looking for this ability from their head coach to rebuild the cohesion that is missing in the locker room. Gase seems to have that ability, assuming it can translate over to the entire time. As with any coaching candidate, uncertainty remains. How much can we credit Gase for the Broncos success under Peyton Manning? How much credit does Gase deserve for “turning Cutler around” when the Bears finished the year 6-10? Even if Gase is the quarterback whisperer and a brilliant offensive mind, can he oversea an entire team and build a respectable defense? These are all valid concerns and questions that Gase must answer during his interview with the Eagles. But based on my review, I think the Eagles could do a lot worse than hiring Gase. In fact, I think he is their best bet. Wow, a lot of work went into that post. But I still struggle with Gase. Note that Martz calls Mike McCoy the “best head coach” in football. That’s silly and it illustrates my concern. There just isn’t much overlap between offensive scheming skills and HC skills. Perhaps that is why the Norv Turners and Mile Martzes and Josh McDaniels haven’t succeeded as HCs. Whereas pairing a defensive-oriented HC with a stud QB seems to succeed more often.